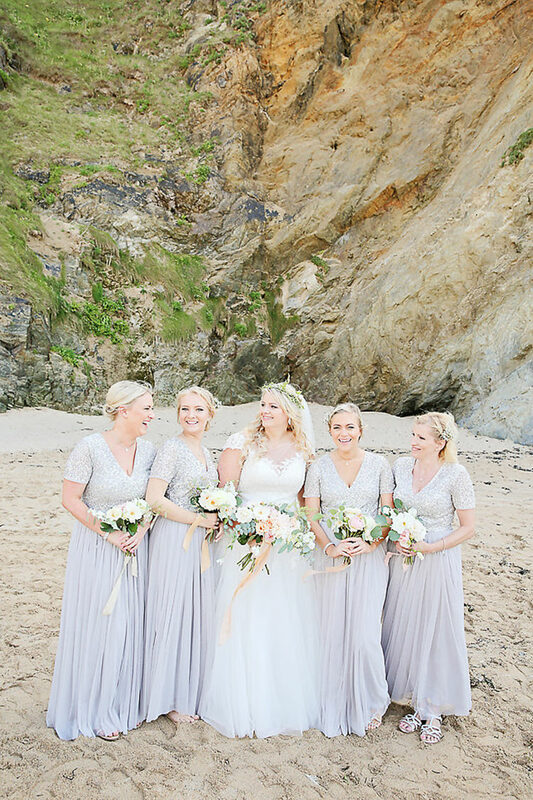 If you’re longing for a bit of sun, sea and sand, you’re going to be blown away by today’s wedding! 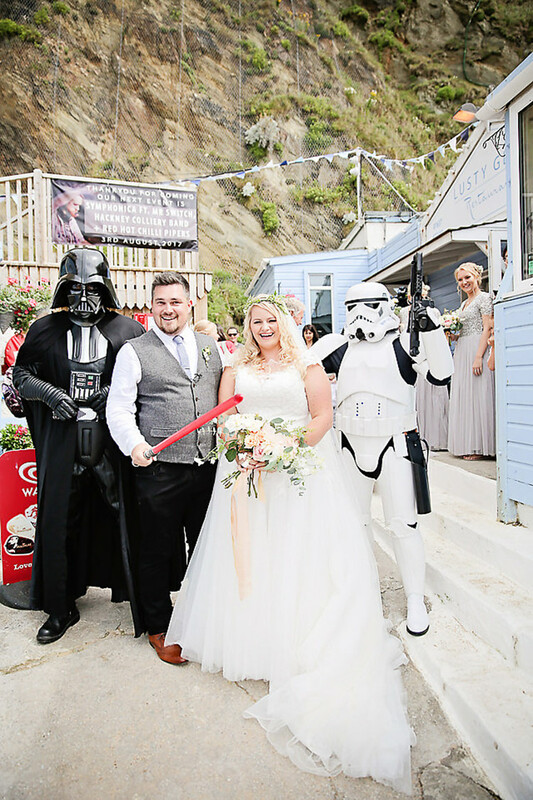 It was a totally relaxed affair but not without a bit of a sparkle, a fun day on the beach with just a hint of Star Wars too! 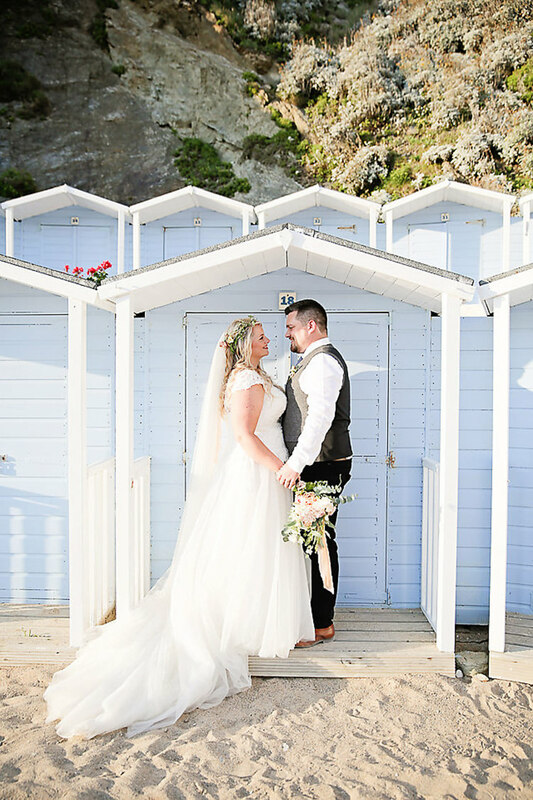 WWW readers Claire and John tied the knot at Lusty Glaze in Cornwall on the 24th of July 2017. 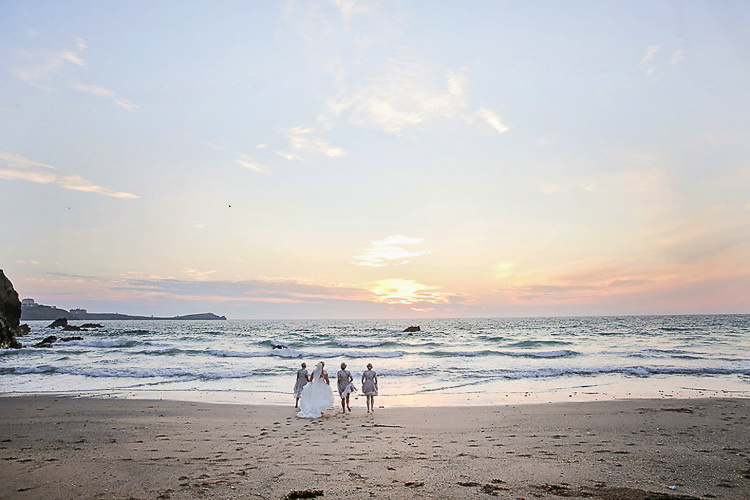 The wedding features the most gorgeous pastels and our pair were treated to the most magical sunset to round off their fabulous day. I love that they had their DJ play an Ibiza chill out set as the sun went down, I can imagine the atmosphere was something really special. 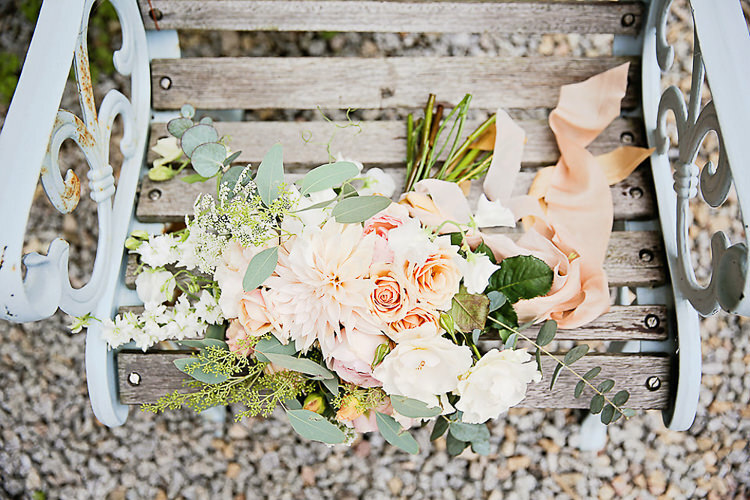 Take a minute to absorb the gorgeous peachy florals, they really are dreamy and match the beach setting perfectly. 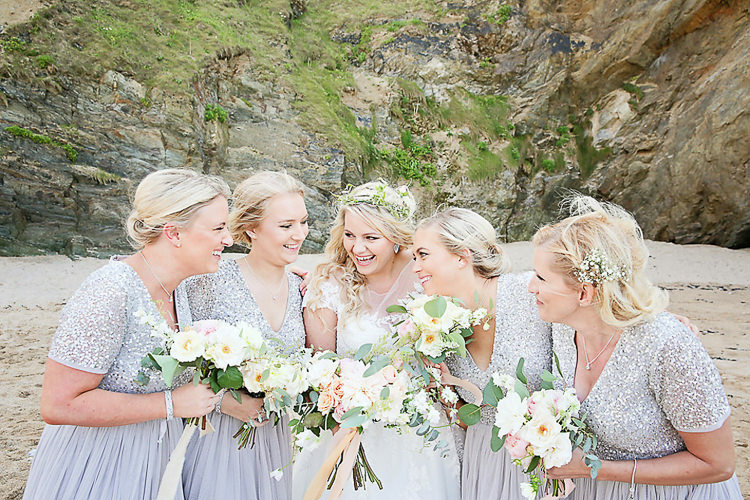 I love how sparkly the bridesmaids are and speaking of all things glittery, you have to check out Claire’s fabulous shoes! 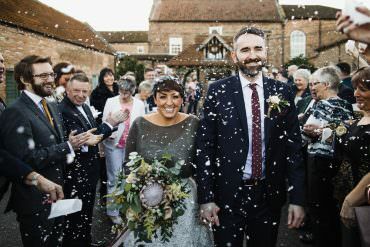 WWW couples really do have the best advice and I love Claire’s words of wedded wisdom today, make sure you take them all in. 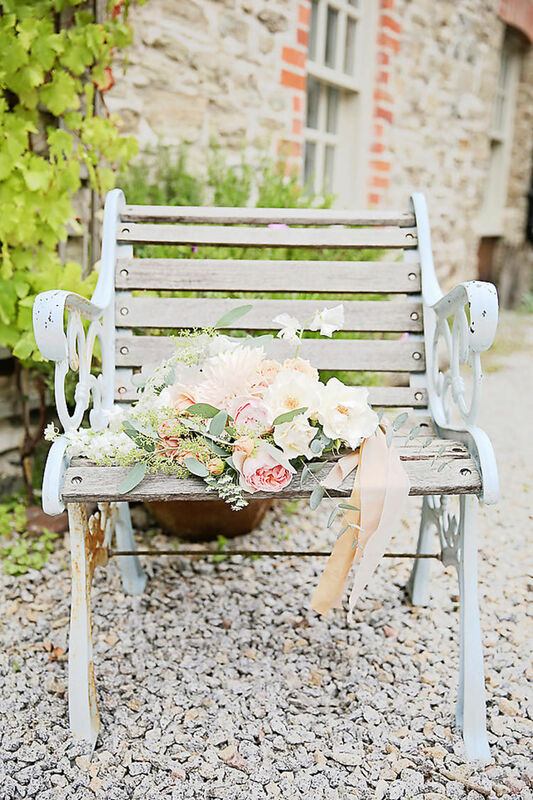 Thank you so much Victoria Mitchell for sharing these brilliant images with us today, just beautiful. 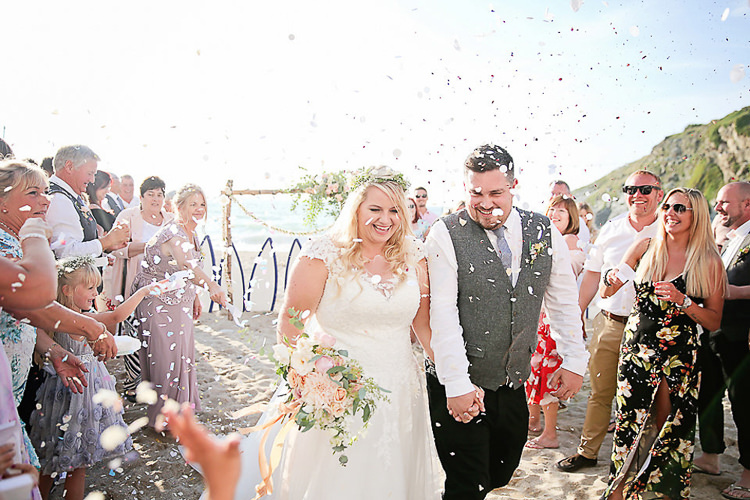 THE PROPOSAL | We were away on holiday in Corfu. It was my birthday and to celebrate John had booked a table in a restaurant down on the beach. 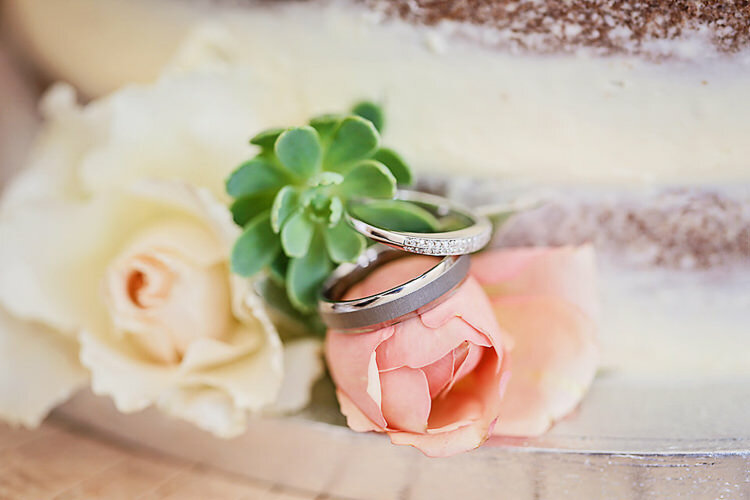 After we had finished our dinner John got down on one knee and produced a gorgeous ring, i was so overwhelmed with emotion that I had forgotten to actually answer and say yes, poor John had to remind me to give him an answer so he could get up! The whole restaurant cheered and we got congratulated by everyone in the resort for the rest of our holiday! 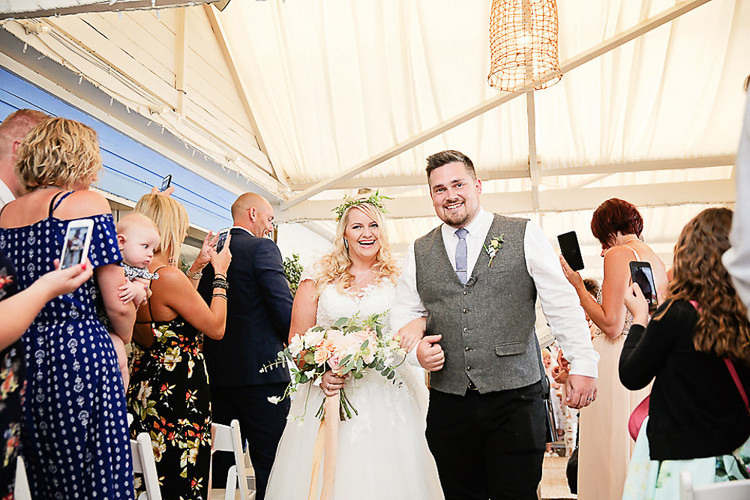 THE VISION | We both knew we wanted to do something a little different for our special day. 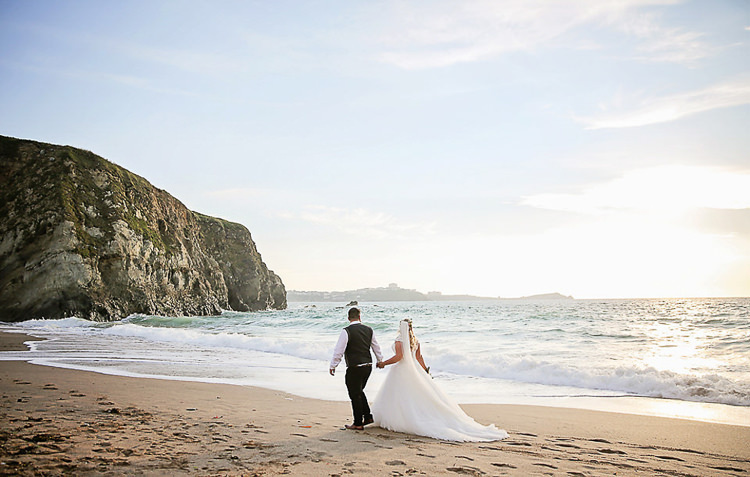 Although we were living in Essex we had our hearts set on getting married in our favourite UK holiday destination – Cornwall. 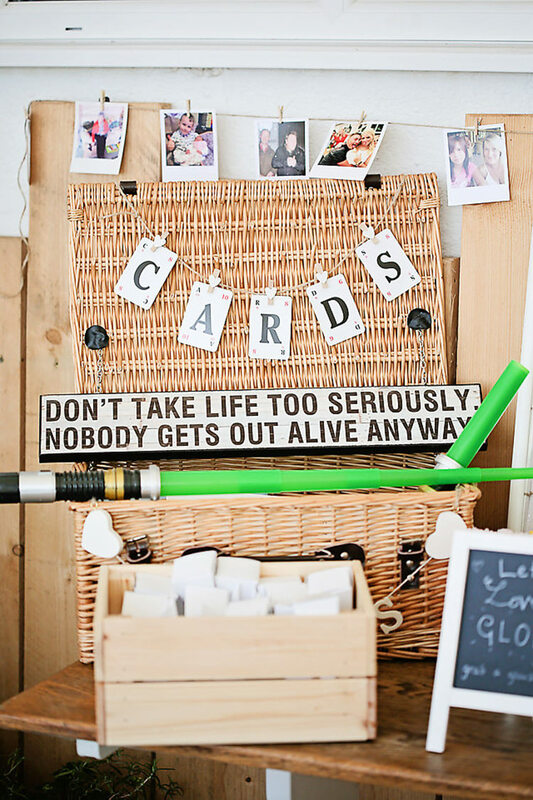 We knew we wanted it to be a relaxed day, almost with festival type vibes, as John and I are a very easy going couple, who love a giggle, which is why we also knew we wanted to add a little nod towards John’s love of Star Wars. 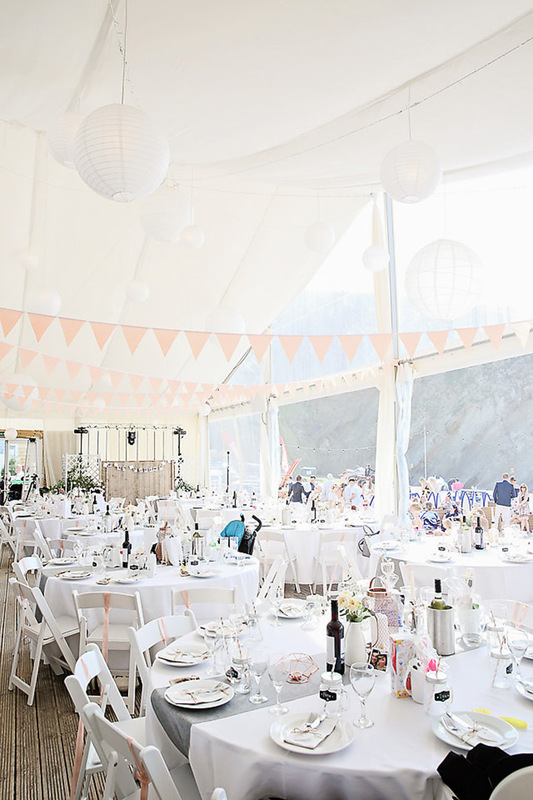 We had a vision of a party on the beach that just happened to involve us getting married at the beginning! 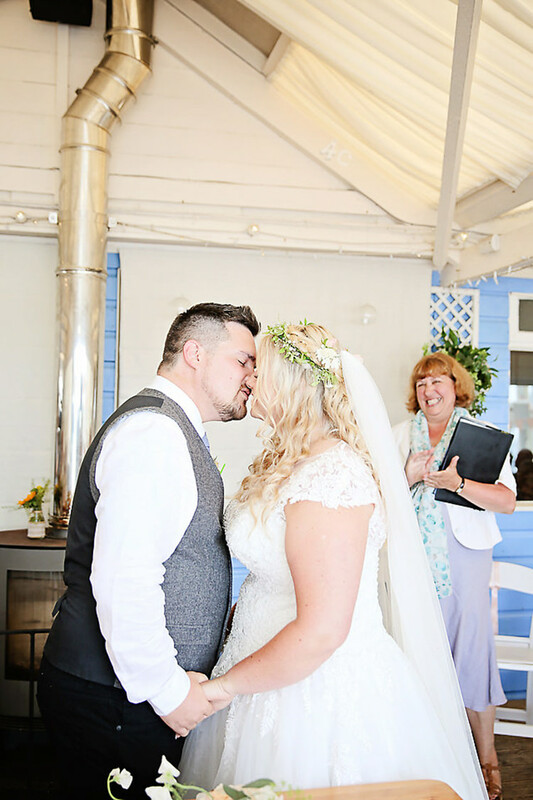 We knew that we wanted a very informal ceremony so we chose the Cornish Celebrants, they were fab, we just felt that a humanist ceremony gave us so much more freedom to say what we wanted to and not what we were supposed to. 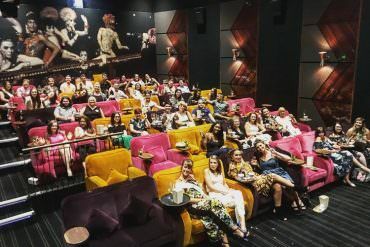 It totally lived up to our expectations! 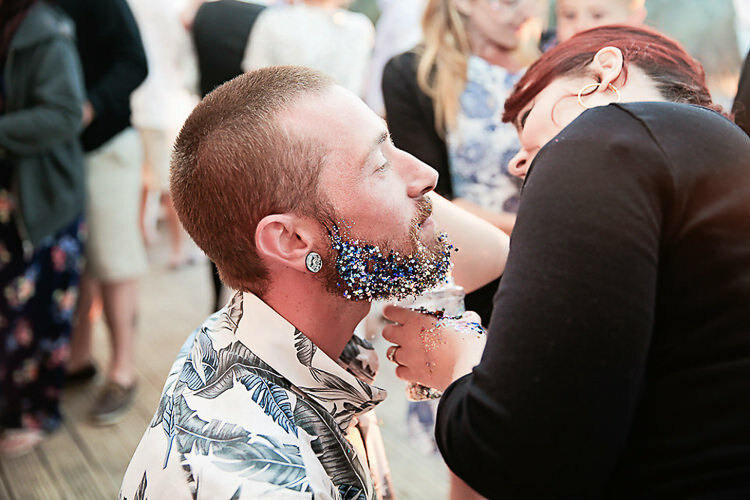 We had a BBQ on the beach, we had glitter sparkles face paint and even had our amazing DJ Robin from Fistral Stereo do an Ibiza style sunset chill out session as the sun went down. 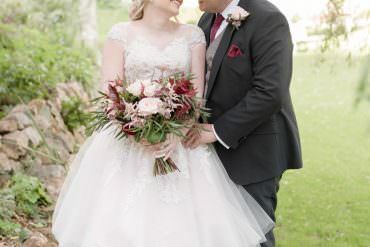 THE PLANNING PROCESS | I was worried it would be difficult due to the fact that we lived hundreds of miles away from where we had chosen to get married, but I did a lot of research on various suppliers by using local recommendations and wedding blogs to get ideas of the kind of suppliers I wanted to use for the look I wanted to achieve. 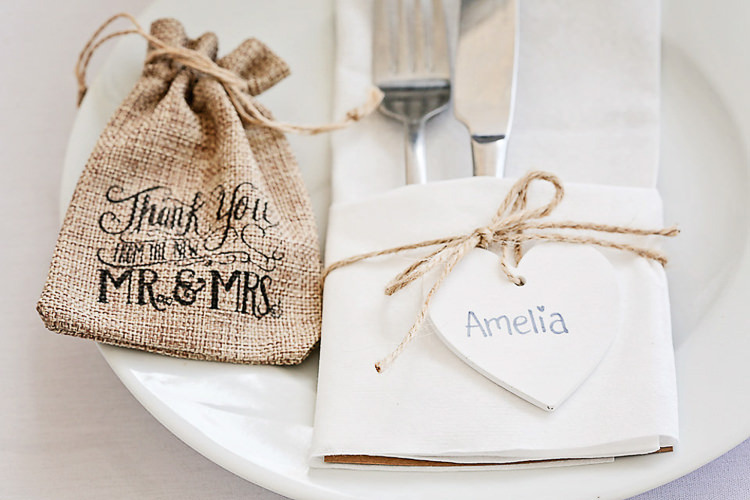 This really worked for us, we were so pleased with all of our suppliers. 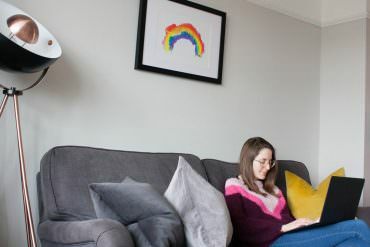 I also spent so many hours designing and crafting a lot of DIY bits and pieces, I am glad I did as I think it made everything feel much more personal to us both. BUDGET | We were extremely lucky to have had help towards this. We then set ourselves our own budget to keep within. We did go a little bit over, but in our eyes it was worth it. 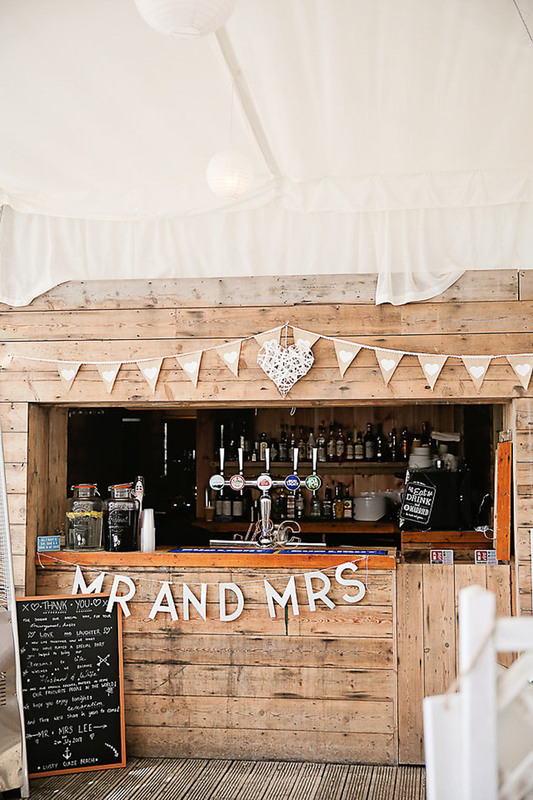 THE VENUE | We had a very long engagement, we got engaged in 2011! So we had untold amounts of time to plan our day. 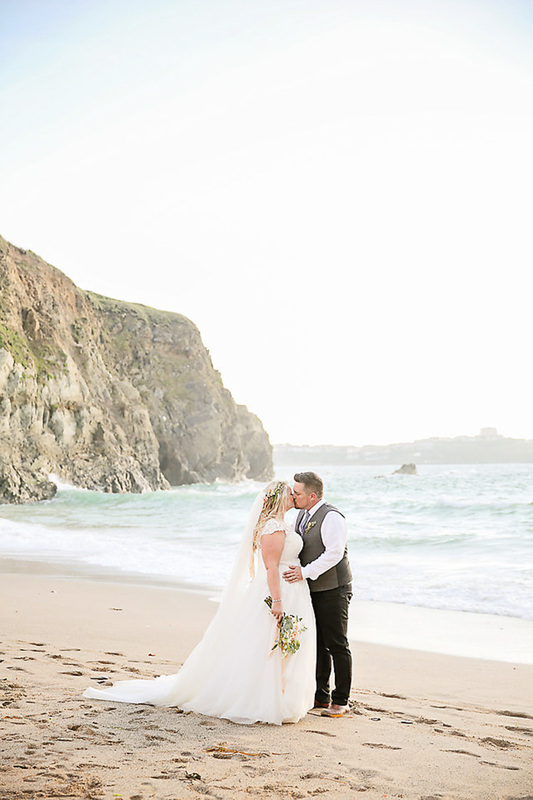 On one of our holidays together in Cornwall we stumbled upon Lusty Glaze Beach in Newquay. 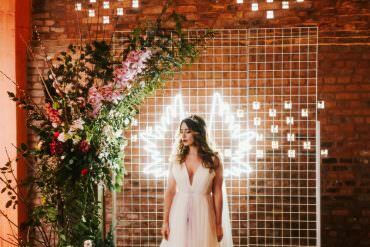 We instantly fell in love with it, and it quickly became our dream venue. 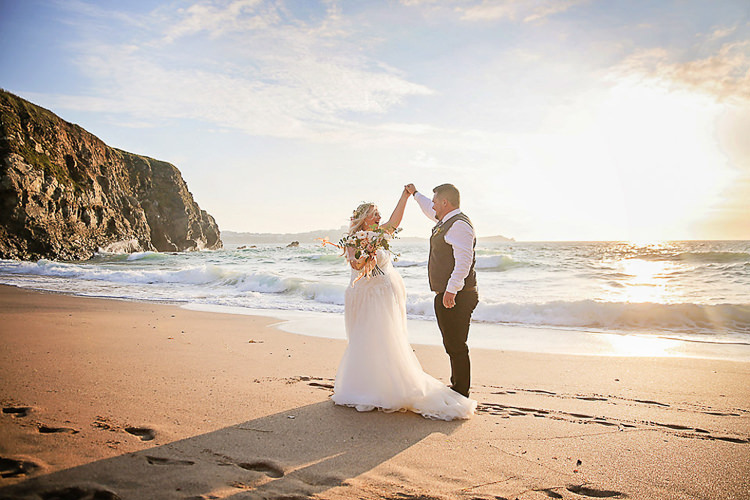 Before we had even booked a date we used to visit every time we were in Cornwall and have a romantic dinner in their restaurant or a stroll on the beach whilst daydreaming about how amazing it would be if we could have our day there. 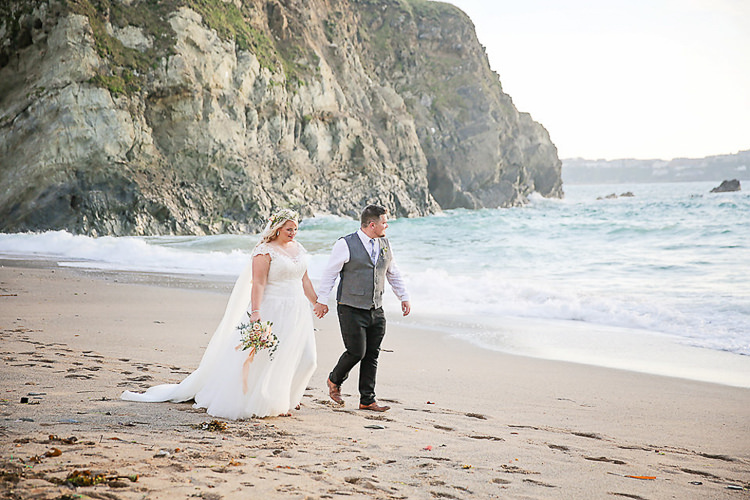 As soon as we went for our first meeting we just loved it even more, knowing we could have a relaxed beach BBQ and Cornish pasties in the evening too! 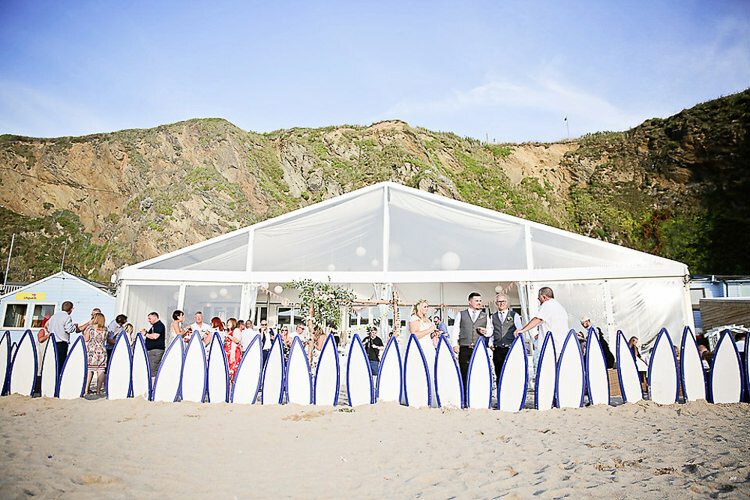 It always had to be Lusty Glaze Beach. 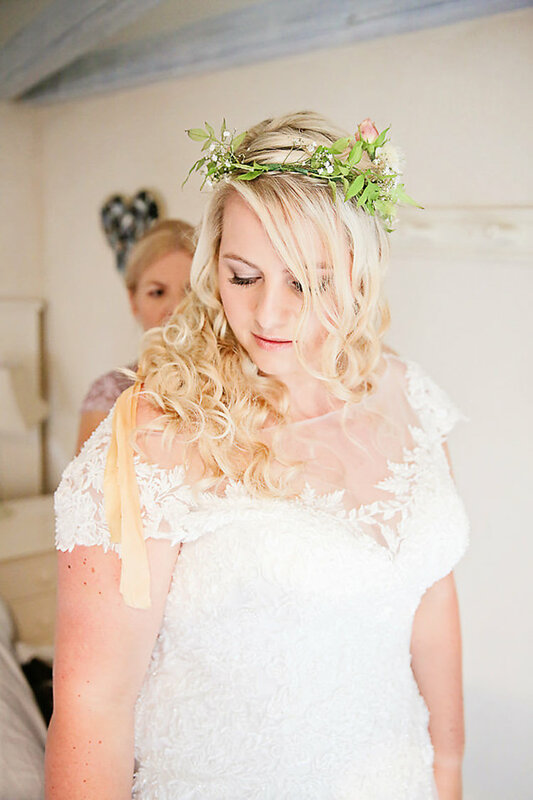 THE DRESS & ACCESSORIES | My dress was a design by Rebecca Ingram, I loved the pretty neck detailing and the hint of subtle sparkle too. 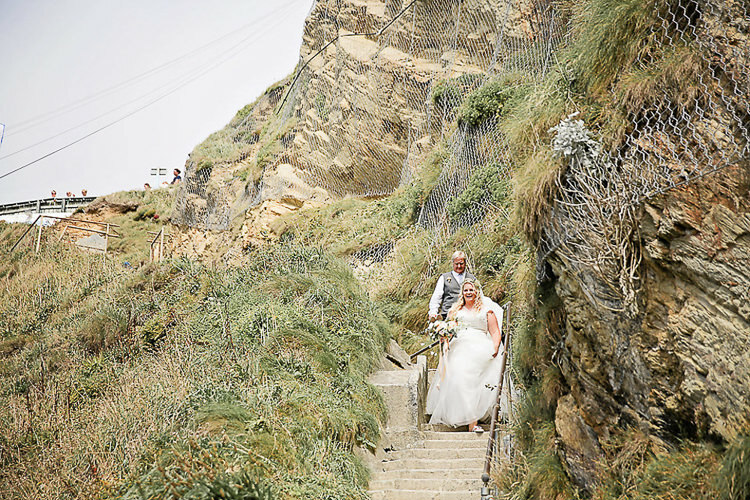 I was worried about making it down the 133 steps to Lusty Glaze Beach with such a long train on my dress but I need not have, with a little help from Naomi one of our lovely wedding coordinators, it was easy! 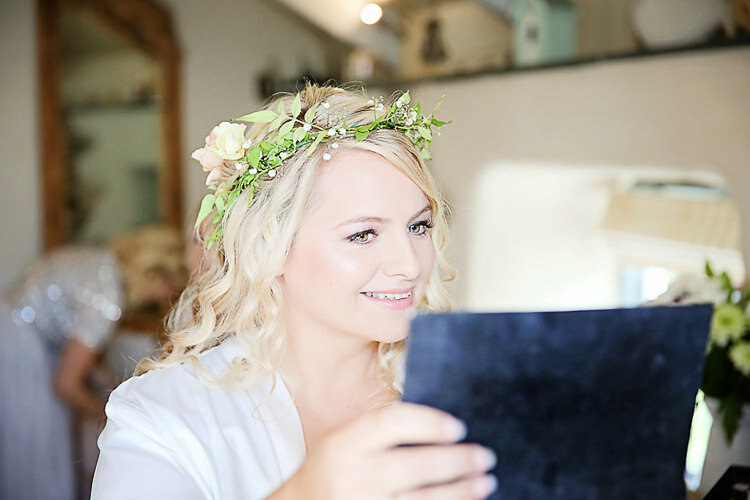 I knew right from the start I really wanted a flower crown, but in the bridal shop I fell in love with a full length veil, so naturally I wore both! 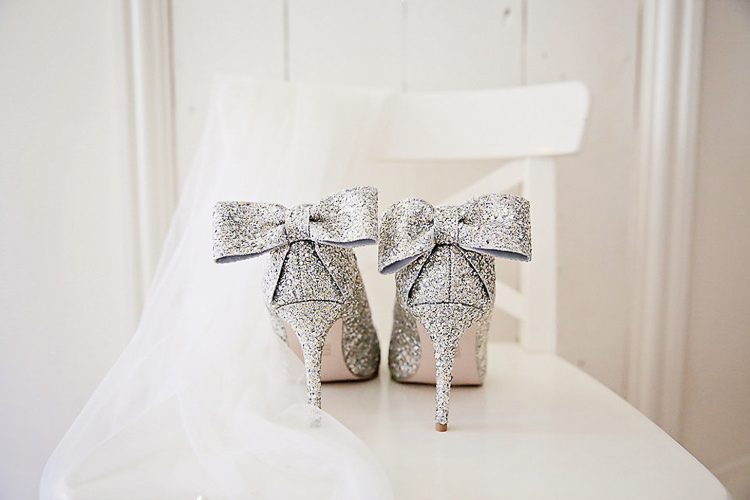 I also had silver sparkly Kurt Geiger shoes with bows on the back, I absolutely loved these, they made me feel like a princess! My jewellery was all from Pandora, a gift from John on the morning of our wedding. 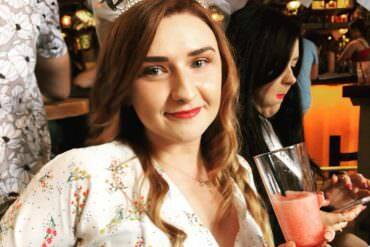 My make up was by Stacey Cremin she was such a find, made us all feel really relaxed, we were all over the moon with it! 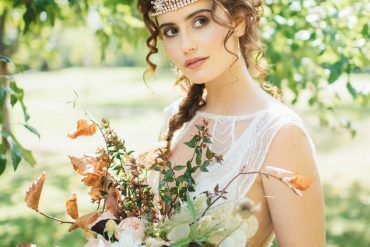 For my hair I knew I wanted a boho beach-y style with lots of curls and plaits, and pretty flowers. 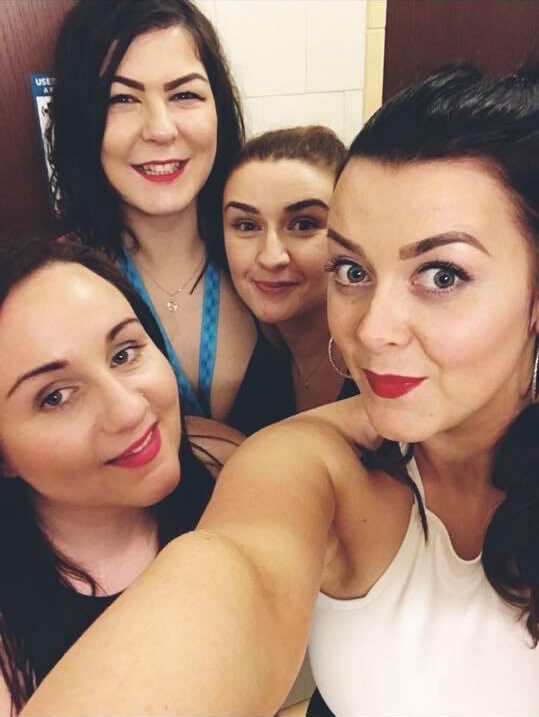 I was amazed at Ellie from Elligant hair’s talents, she totally understood what I wanted and I was blown away by the results. 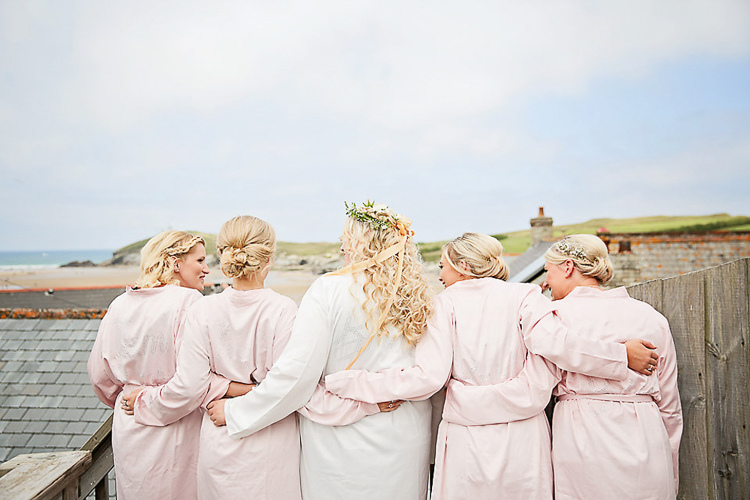 She also did a fab job on my mum and the bridesmaids too! 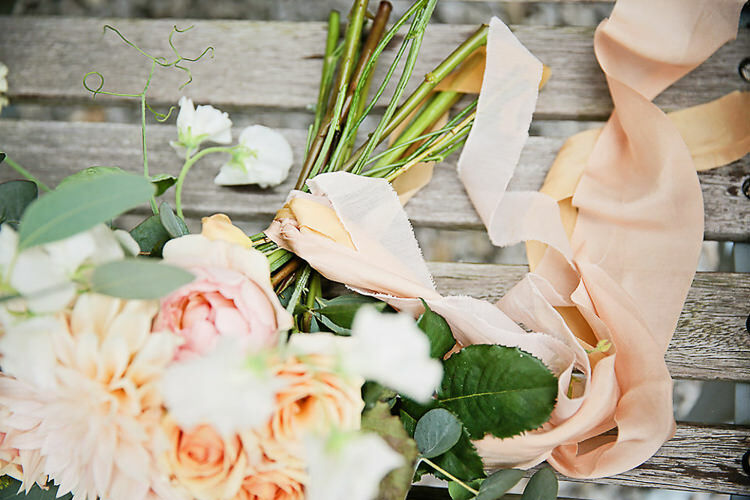 FINDING THE DRESS | I only ended up visiting one bridal shop – Grace & Lace. I had no idea what I wanted, I just looked through the racks and tried on everything and anything that took my fancy. 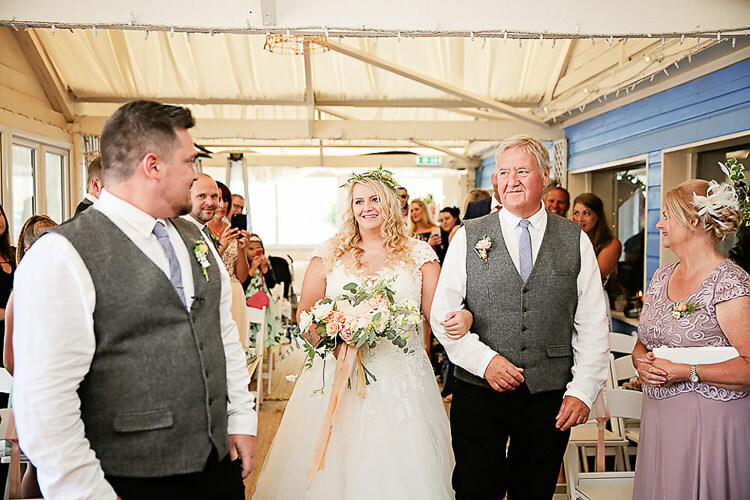 I took only my mum and sister in law with me initially, and once I found my dress I took my best friends back to show them, as I had started to doubt my choice! As soon as I tried it on again I remembered why I fell in love with it. 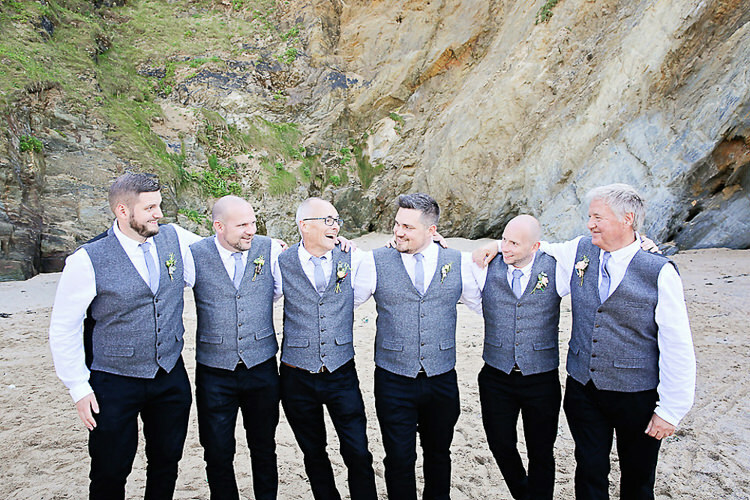 GROOM’S ATTIRE | John and I pieced the men’s outfits together. 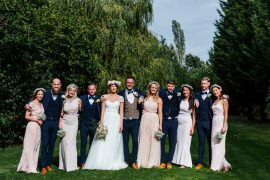 John and all of the groomsmen wore a white linen shirt with a tweed style waistcoat, black jeans, tan brogues and a light blue tie. Everything came from Next. 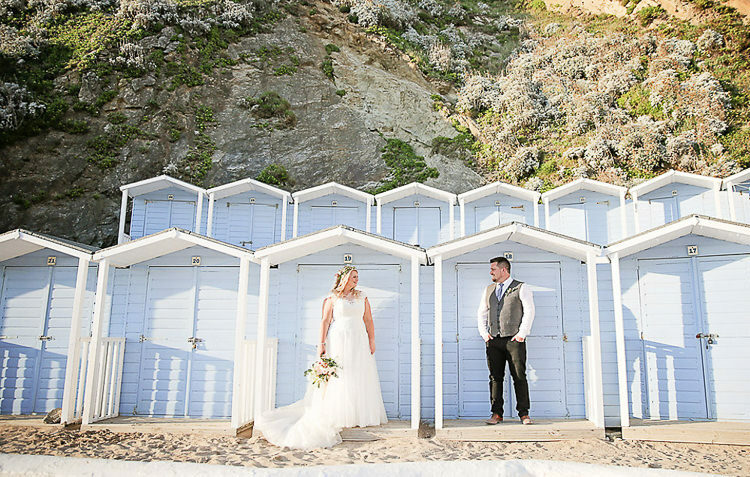 We both knew we wanted them to all look relaxed and we didn’t want anyone getting too hot either, as we were getting married on the beach. All of the boys had Star Wars buttonholes and John also had a silver light saber tie pin! 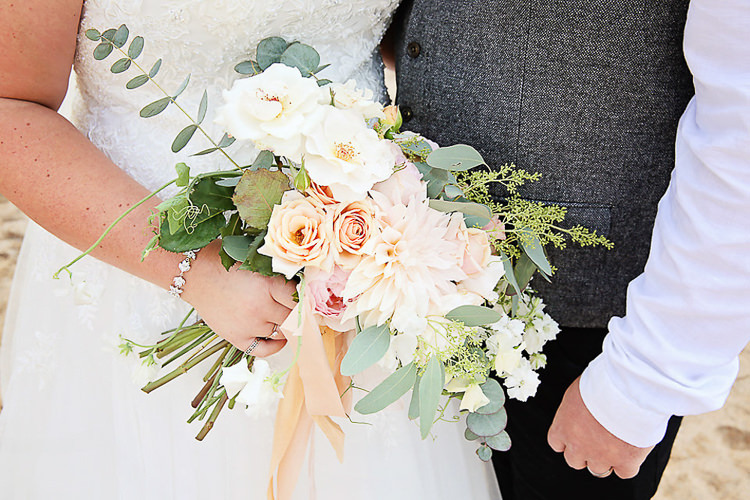 THE READINGS & MUSIC | I walked down the aisle to The Verve’s Bittersweet Symphony. It is one of my absolute favourite songs and I had known pretty much all my adult life that this was going to be the song! After we were married we walked out to the Star Wars theme tune. This is when Darth Vader and a Stormtrooper made their appearance much to our guests amusement! 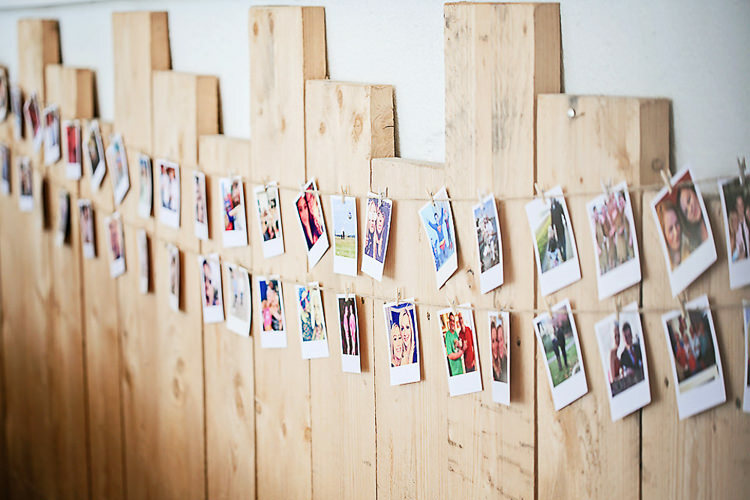 They were a really fun addition to our day staying for photos with our guests, the children loved it! 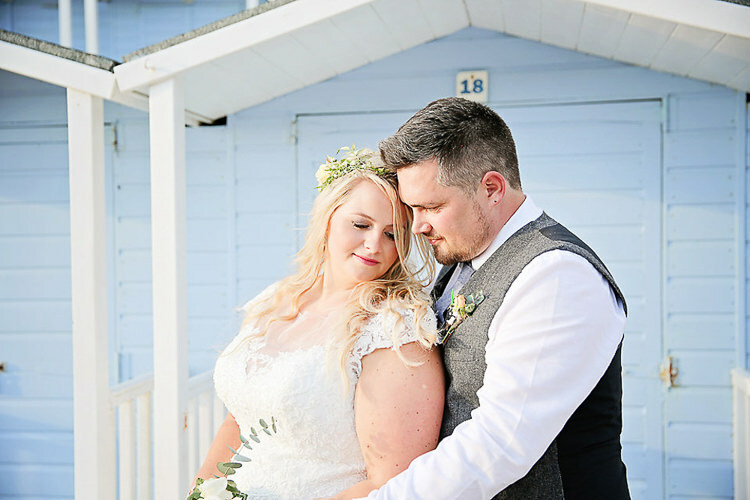 Our first dance was to Coldplay Yellow, we are both big Coldplay fans and this song just seemed to fit. We wanted something the guests could sing a long with too. 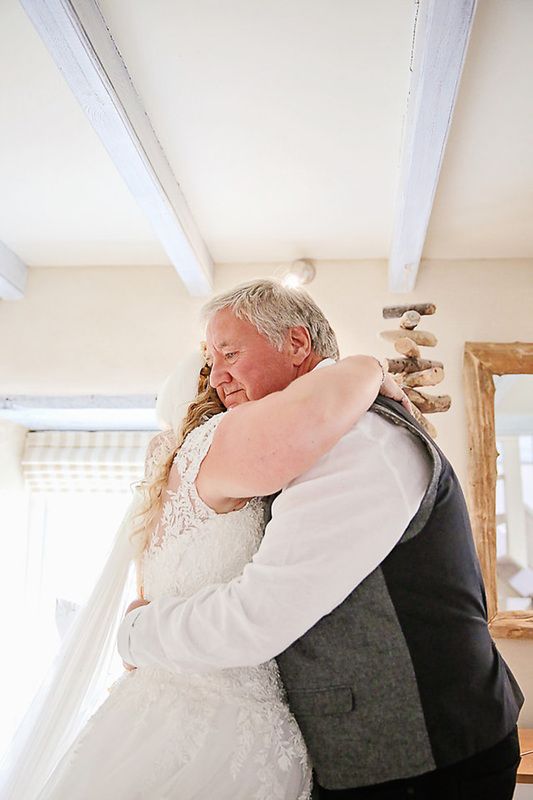 I also chose to have a father daughter dance to Oasis Don’t Look Back in Anger as I had grown up with my dad playing Oasis music and this is a song that always makes me think of him! It is a moment I will treasure forever, everyone joined in dancing and singing along too! We had John’s sisters Lorraine and Amelia do a reading together called I Like You by Sandol Stoddard Warburg. My mum also did a reading called A Recipe for Marriage. 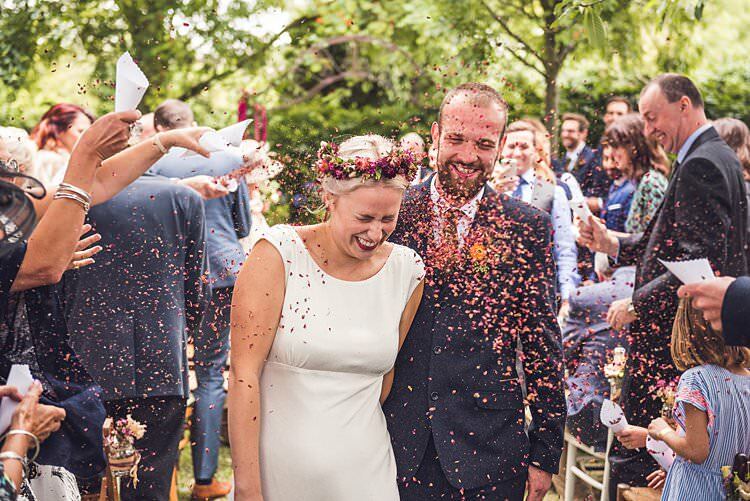 We chose these readings because they are lighthearted, and we felt that they reflected us both and our relationship, fun but with a bit of a soppy deeper meaning too! 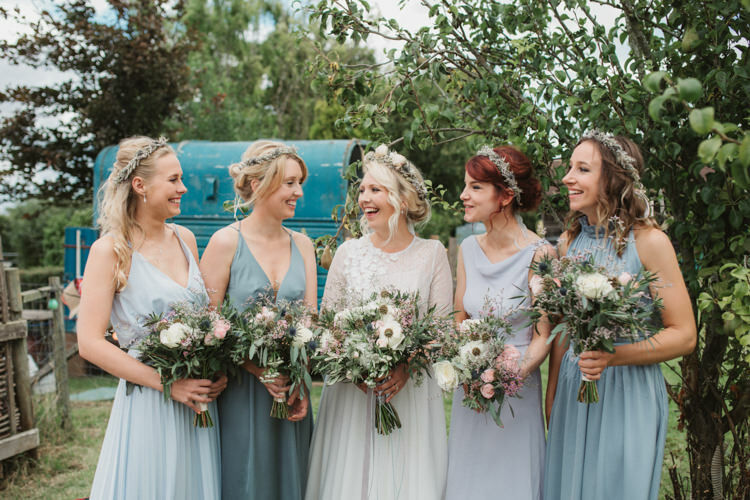 BEAUTIFUL BRIDESMAIDS | My four stunning bridesmaids were my friends Claire, Daniella and Liz and our niece Chloe. 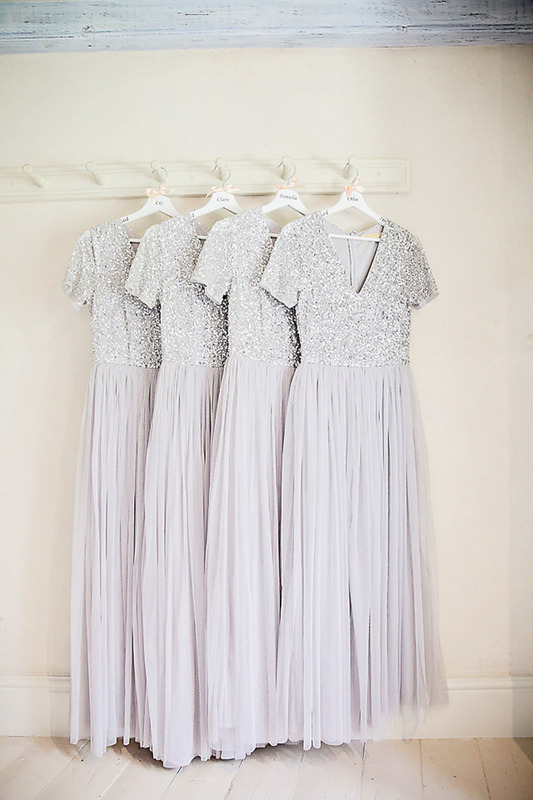 They all looked beautiful in grey and sequin tulle maya maxi dresses from ASOS. 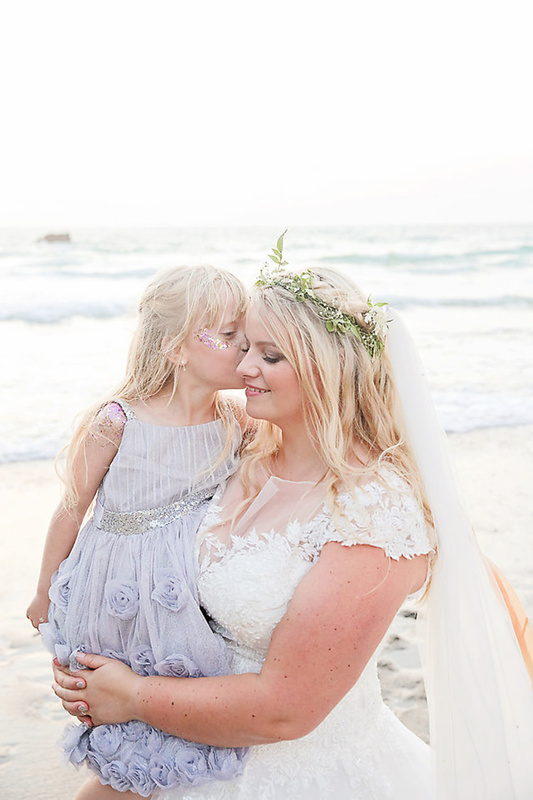 We had Libbie and Tessie as our flower girls, as Libbie was a little older we let her choose a grey dress to tie in with the bridesmaids, her sparkly dress was from Monsoon. 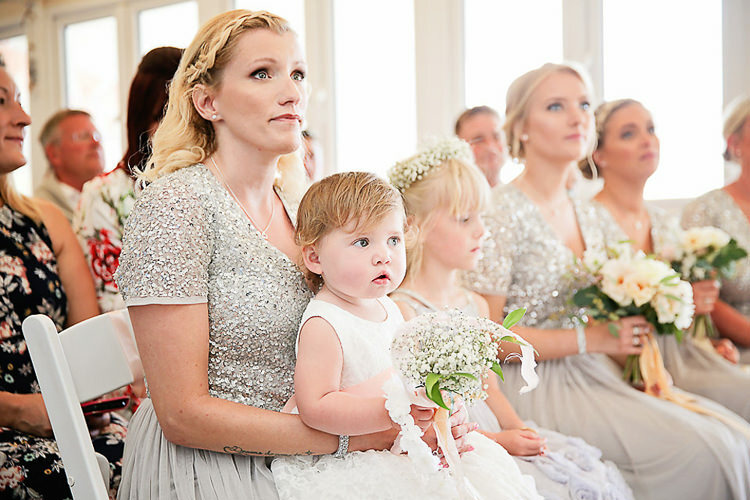 Tessie’s little white dress adorned with flowers was also from Monsoon. We had four cheeky page boys! Jimmy, Lucas, Joshua and Harry, they all wore shorts from Debenhams with braces and peach bow ties from ‘Ties R Us’. 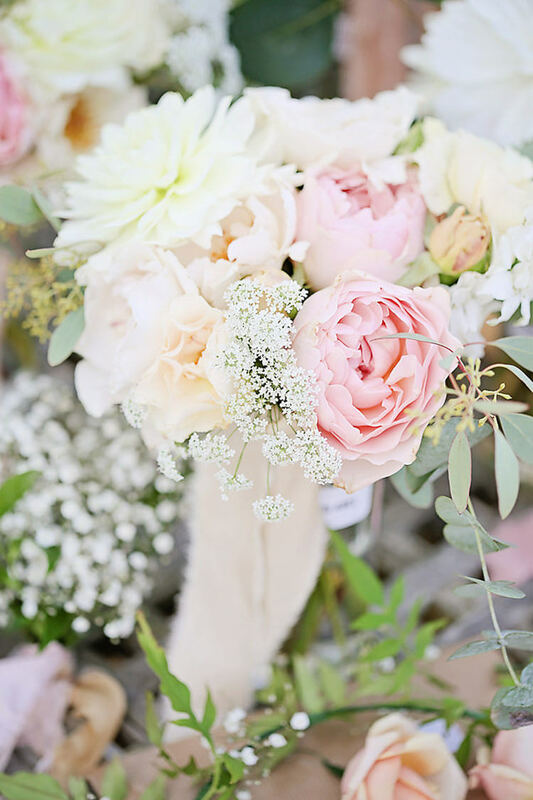 THE FLOWERS | Our beautiful flowers were by Lou of LOULABEL floral design. 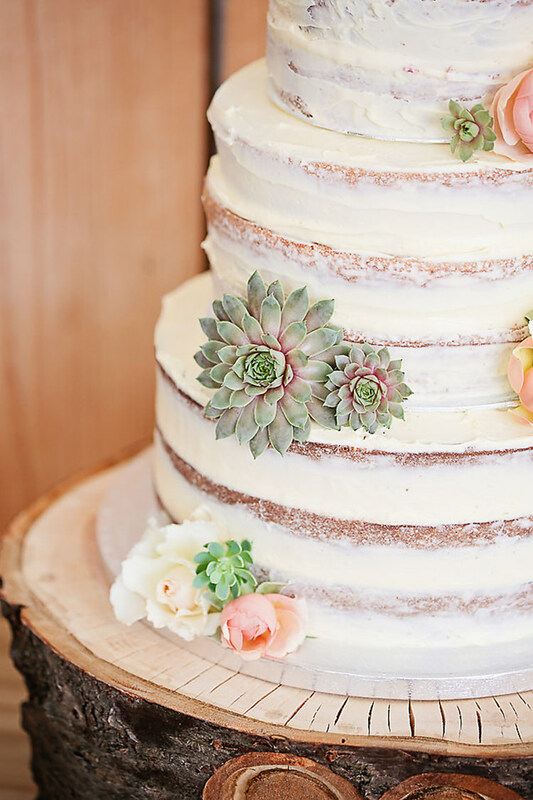 I knew I wanted boho style peach and cream vibes with trailing ribbons and a flower crown. Not forgetting our Star Wars buttonholes! 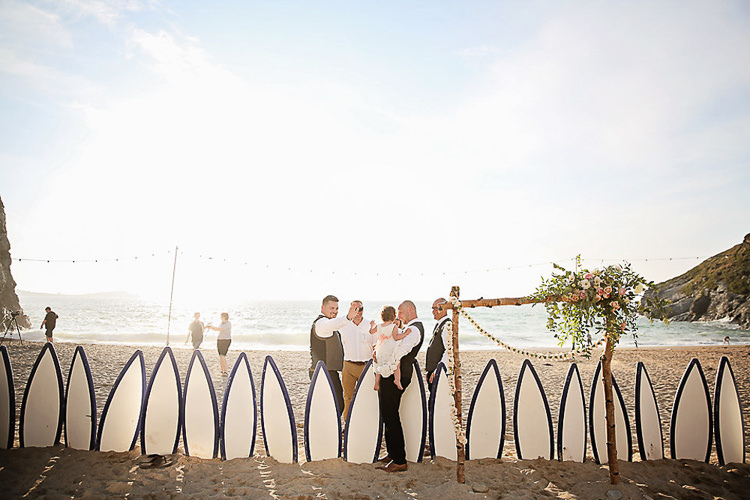 We also had an amazing statement flower piece outside on the beach for everyone to have photos in front of. THE CAKE | Our two very talented friends Debbie and Emma were our cake makers. Debbie made our amazing cake that then had to be transported all the way from Essex to Cornwall! Emma then had to head down to the venue on the morning to piece it together. They did a fantastic job! 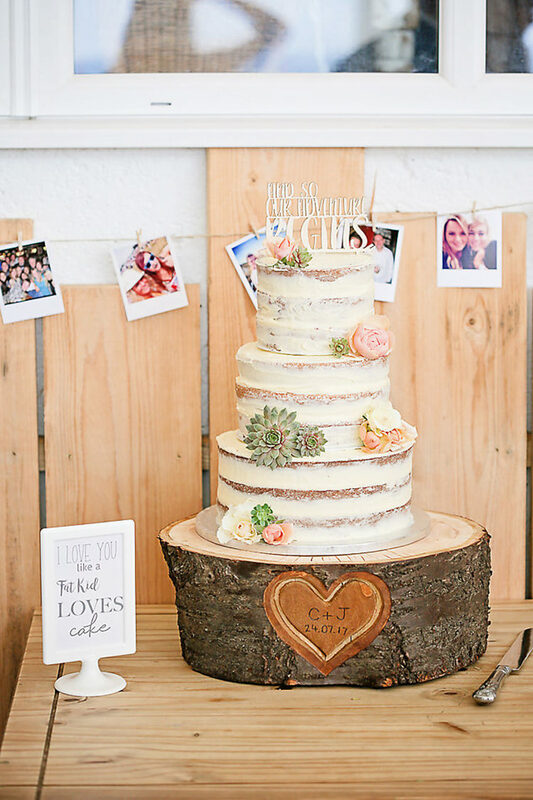 The cake topper was from Etsy. YOUR PHOTOGRAPHER | Our photographer Victoria Mitchell was incredible. We just couldn’t recommend her enough. 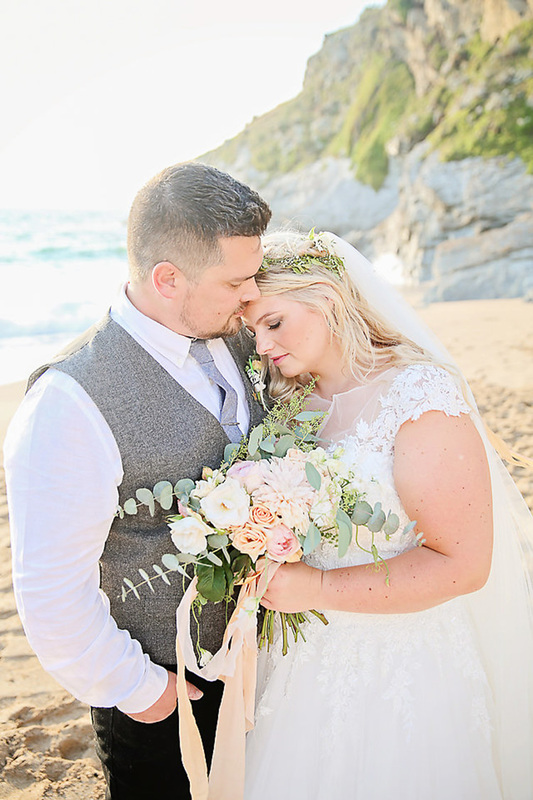 We are over the moon with our photos from the day, they are beautiful and shall be treasured forever! 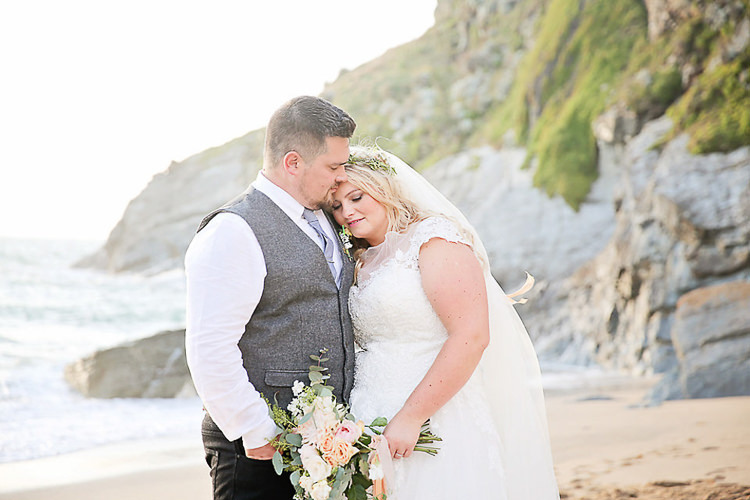 Victoria caught all the magical moments we were hoping for, and more! Whilst so easy to be around making us feel completely relaxed. We had so many people comment on how great she was and how much she was naturally a part of our day. 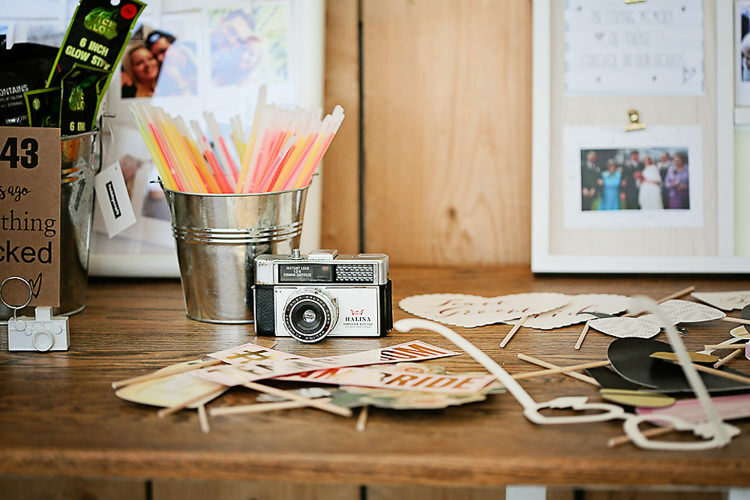 YOUR VIDEOGRAPHER | Colbridge Films. Colin and Bridget were fantastic and totally unobtrusive. They travelled all the way from Essex to film our day! 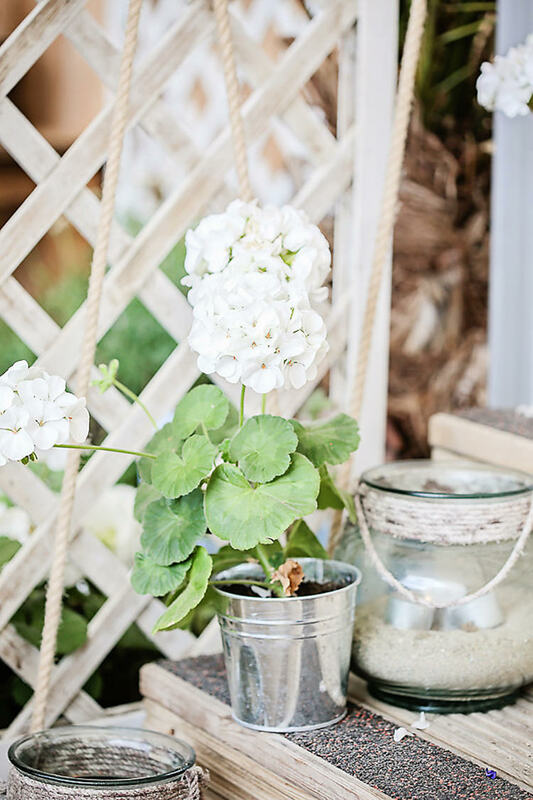 THE DETAILS & DÉCOR | I spent hours and hours designing and planning lots of DIY bits and bobs for our wedding. 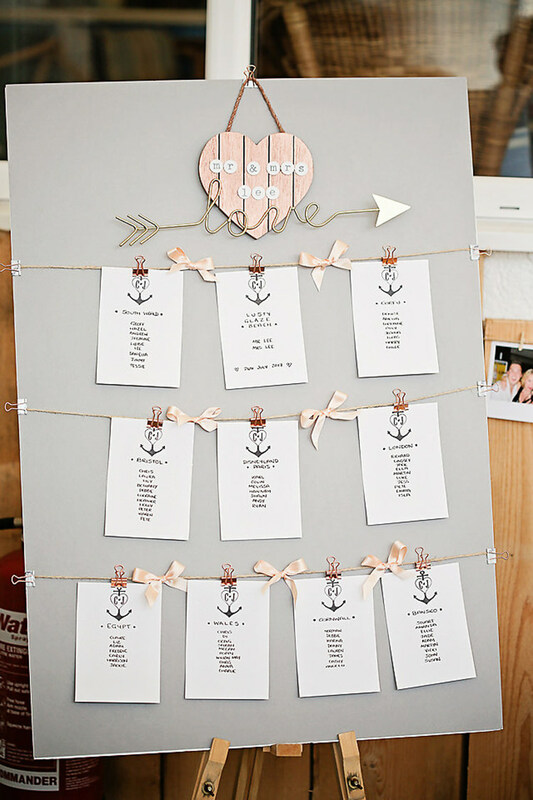 I handmade all of the invitations, I also designed and made our table plan. 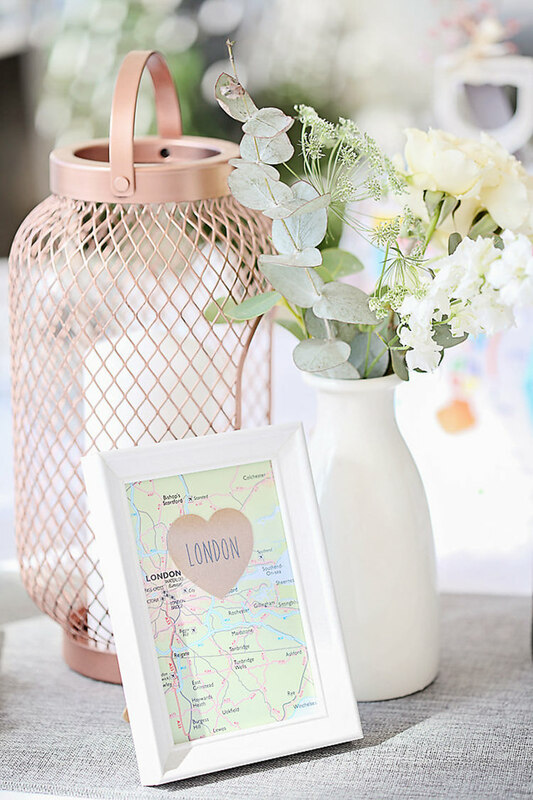 I sprayed black lanterns from Ikea rose gold to use as centrepieces. I used maps of the places we had visited together framed with a polaroid photo of us there as table names. 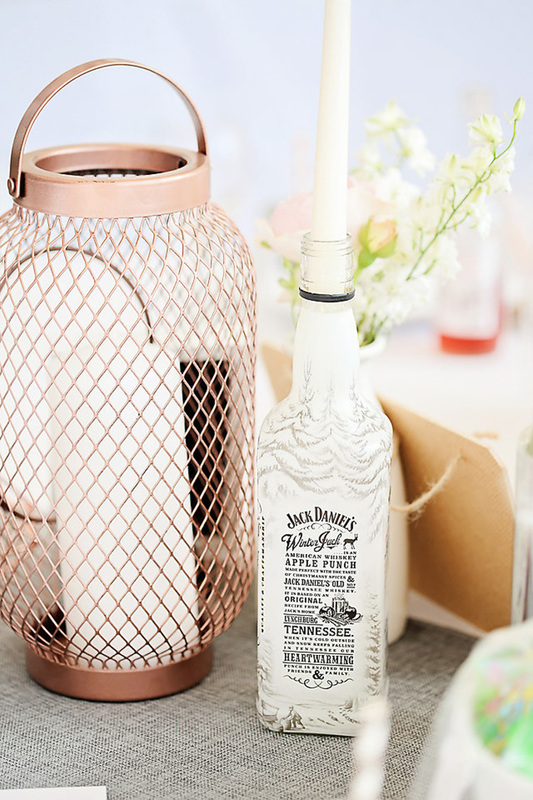 We used different variations of empty Jack Daniels bottles as candle holders as a nod to John’s love of whiskey! 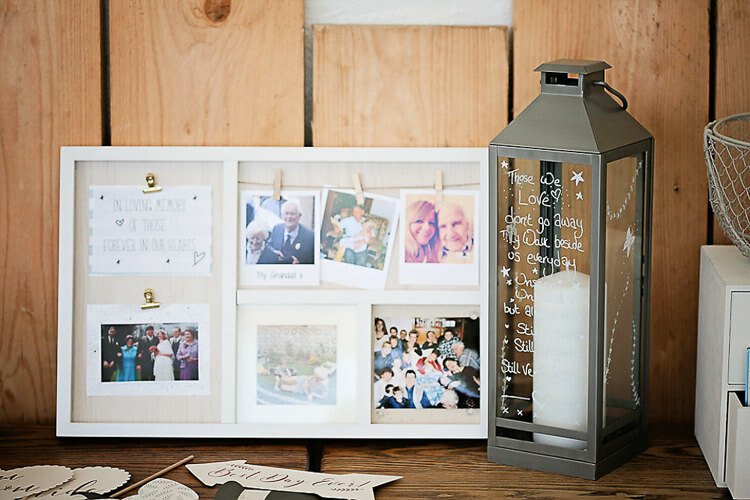 I made everyone a personalised chalk named mason jar as a wedding favour along with us making a donation to the Make a Wish foundation. 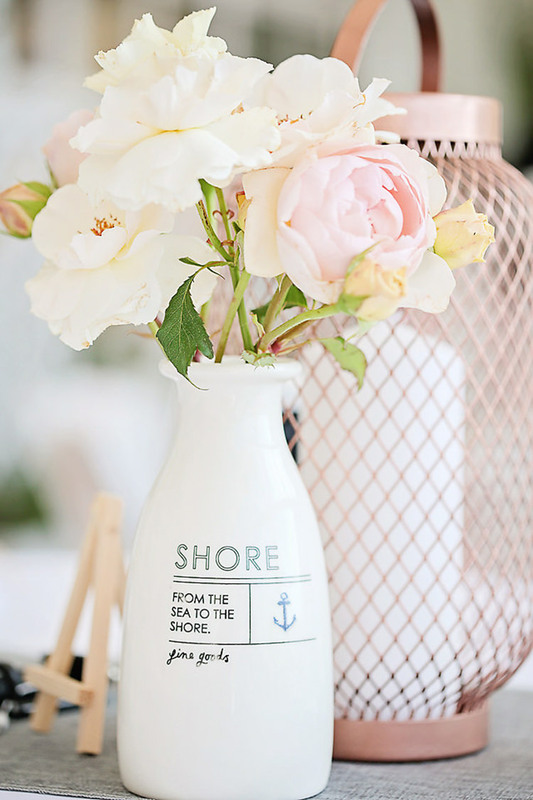 We had a really cool anchor stamp made with our initials on, this was a really cheap buy from Ebay but it was so effective. We had Cornish postcards that we asked everyone to fill in with a suggestion of an adventure as a guest book. I had made some chalk board signs to hang up around the venue. We had glow sticks and inflatable light sabers in the evening for the children which went down a treat! 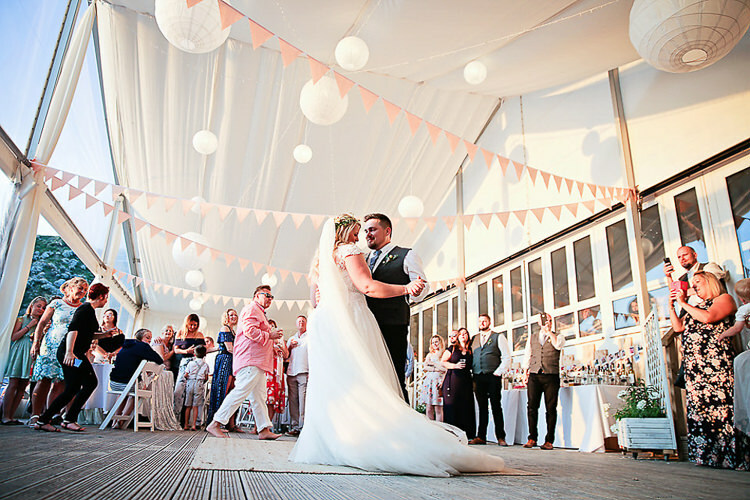 My lovely mum put a huge amount of time and effort into hand making over 100 meters of peach bunting which Lusty Glaze hung up for us, nothing was too much trouble for them, it really set the room off and I absolutely loved the splash of colour it added to reflect our peach, rose gold, grey and cream colour scheme. 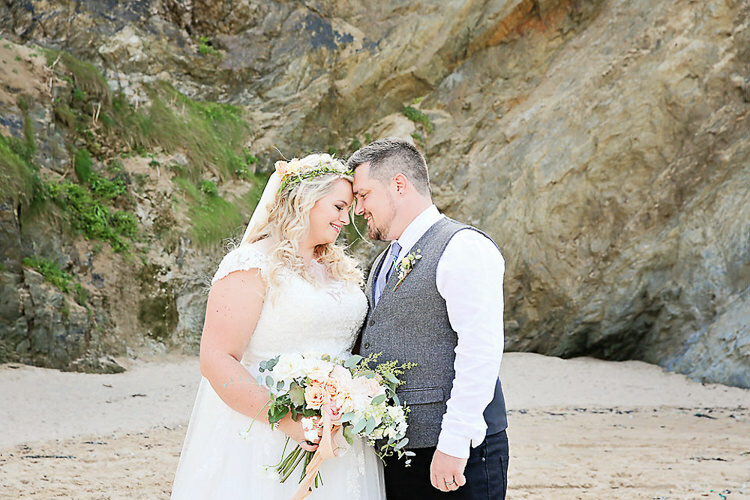 THE HONEYMOON | We stayed in Cornwall for our honeymoon, which was lovely as some of our friends and family were still there and we met up with them on the beach for a bit of surfing later in the week. We had planned to jet off for a bit of sun in 2018 but since then we have had a little surprise who will be due in April! So our honeymoon is on hold for a while. MEMORABLE MOMENTS | The whole day was just incredible. 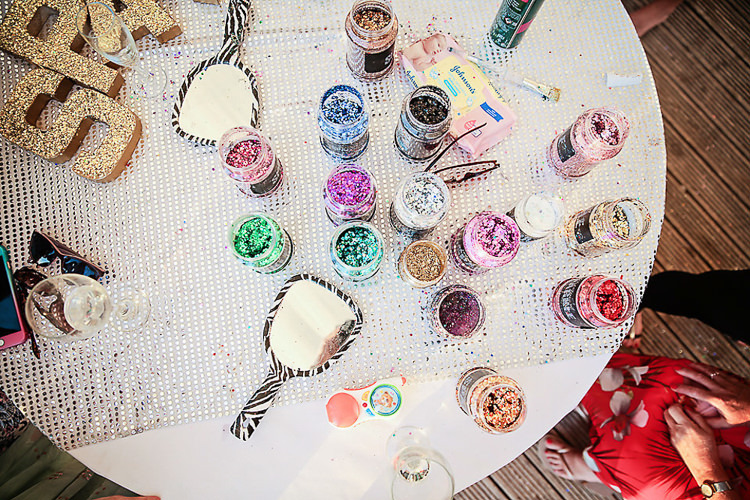 Getting ready with all the girls was great fun in our beach themed cottage on Porth beach. I will never forget the look on John’s face as I walked down the aisle, a moment that will stay with me always. 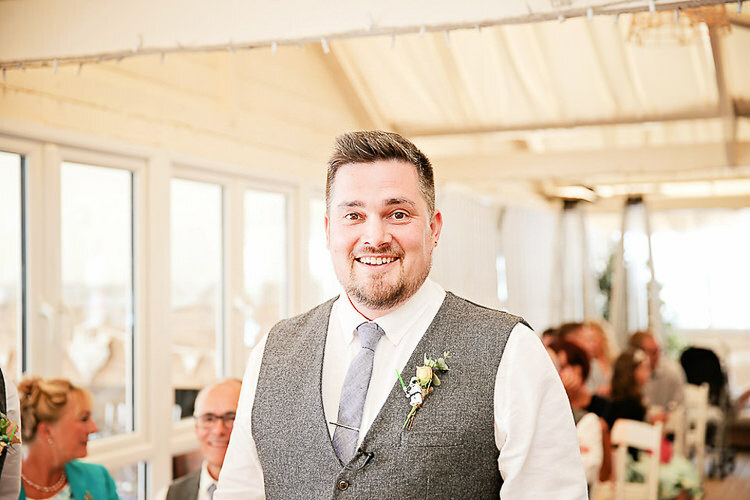 The moment when a Stormtrooper and Darth Vader appeared at the end of the aisle was a great one too! 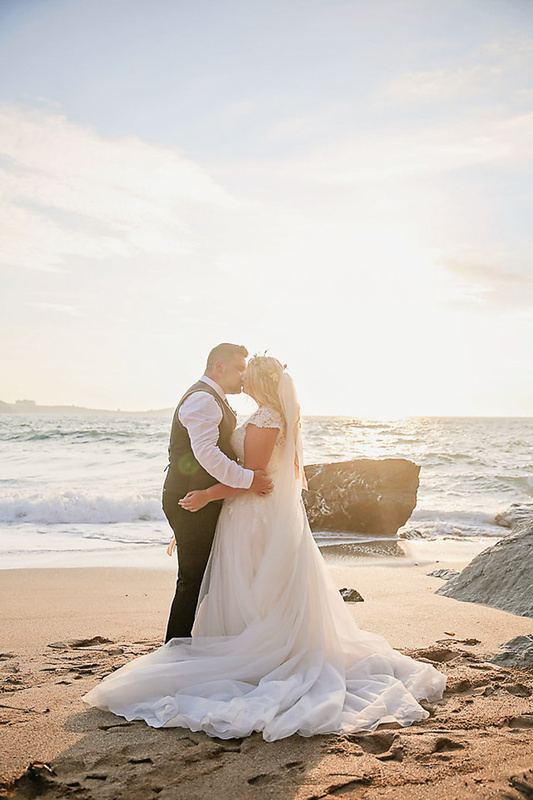 One of our most treasured moments was having our little bit of alone time whilst having photos, walking hand in hand at the waters edge at sunset, I could hear our DJ, Robin playing awesome sunset chill out songs and it just made the moment. 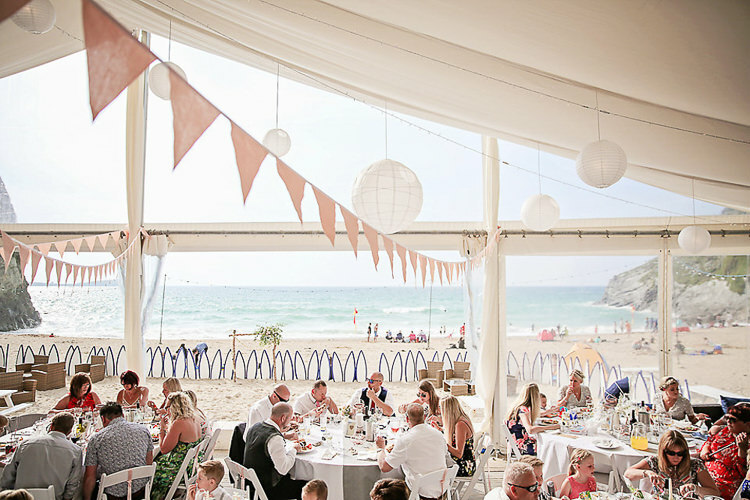 Looking back at our guests sitting out on the beach, sunglasses on, drinks in hand, such a perfect moment. 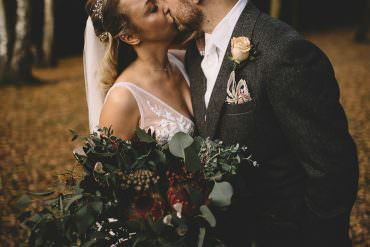 ADVICE FOR OTHER COUPLES | Everyone says it, but I cannot stress enough how fast the day goes! Enjoy every minute, take a minute whenever you need to, do not feel rushed by anyone it is your day! Look around and take in what is happening around you! It is a blink and you’ll miss it day! 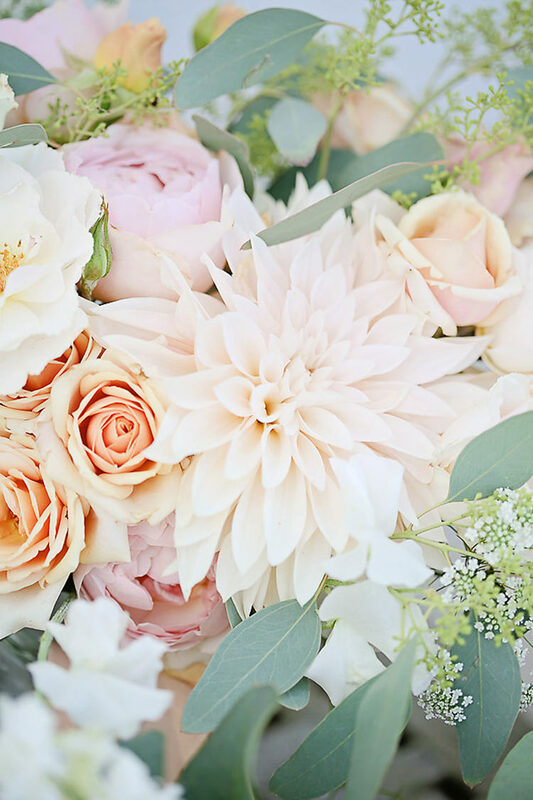 Don’t stress about the small details, everything will fall in to place and the main thing is that you are getting married to the love of your life with your friends and family surrounding you! 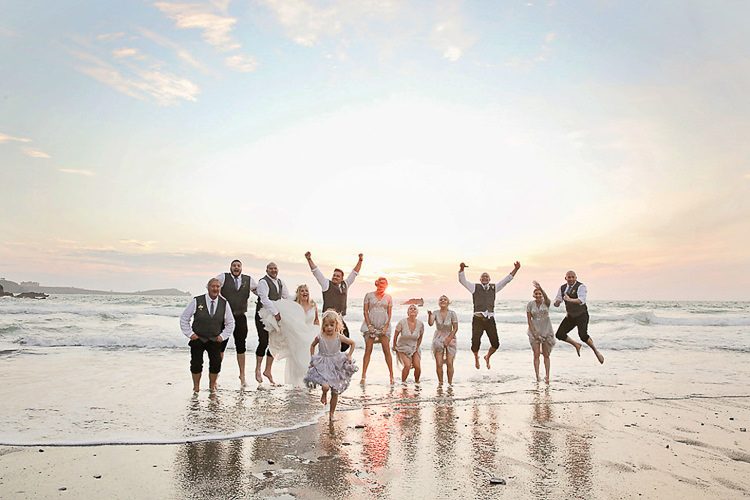 Make sure that you take a moment with your new husband/wife to just be together in the moment on your own. We had a sweetheart table for two at dinner and we are so pleased that we did. It was so nice to have that quality time with each other.